Yesterday I shared some ingredients in packaged foods that we all should be careful about consuming. Thank you to my friends who gave me such wonderful feedback on the post! I am considering writing one post each week with an ingredient that I consider to be worrisome. Sodium Benzoate was one of the ingredients I spoke about yesterday, and it is extremely common in pickled foods & dressings. Today I’d like to share a very simple dressing and salad I made for myself for dinner. This honestly took me MAY BE five minutes at most to make, and washing the fruits & vegetables was the most time consuming part. A lot of times when I eventually tell someone that I eat living foods, I am a vegan they assume that I only eat salad. What my guess is they think I literally eat a piece of baby spinach at a time. Salads do not have to be boring! 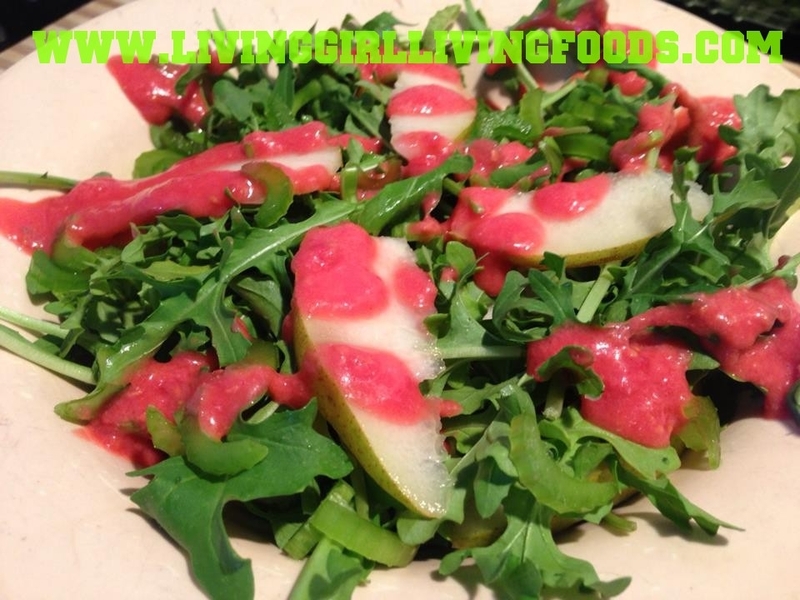 Here is a spring inspired bitter sweet salad with a homemade dressing, no sodium benzoate is going in this tummy box 😉 If you are interested in seeing some more living vegan homemade dressing recipes here is a link. Blend until smooth! If you can not handle raspberry seeds strain the dressing. Honestly it adds a fun lively texture to the salad & gives it a beautiful appearance. Berries hold most of the nutrients in those little seeds that tend to get stuck in our teeth. I served this over 6 handfuls of arugula, one celery stick cut from left to right (moons!) and half of a bartlett pear thinly sliced. Please feel free to add romaine, spinach, jicama, beets, carrots, cucumbers, peppers, cabbage, sprouts, mint, cilantro, avocado, whatever tickles your fancy! If you aren’t into arugula but want to try another bitter green in a previous post I have a list. Use a spiral slicer to make funky curvy noodles, cut veggies into matchsticks, use a vegetable peeler to make long wide strands, make cubes, or whatever shapes & textures that grab your attention. The raspberries and celery make an amazing pairing, the salty crunch can help with any tartness or too much sweetness from raspberries. 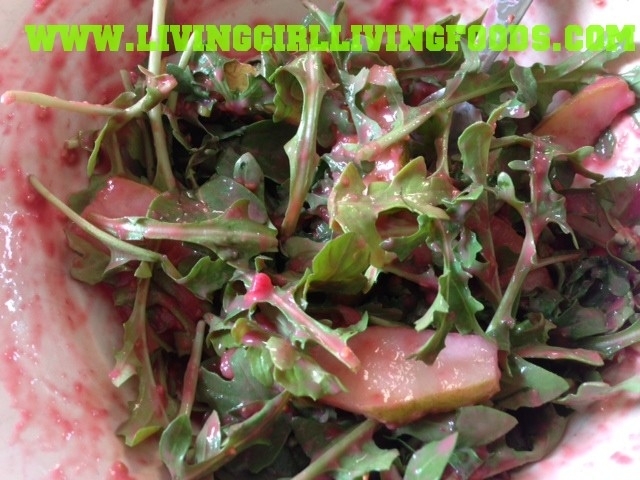 Arugula goes well with most fruits. Some of my favorites to pair with arugula are: mango, avocado, grapefruit, any type of orange, and strawberries. Pears give a nice smoothness that can even taste very similar to something creamy. I highly recommend mashing up your salads, this way less dressing will be needed and the fruits, vegetables and so on are crushed activating even more flavor 😀 My salads always look like I was having a little too much fun playing with my food. P.S: 7 Days left for my $50 e-gift card giveaway with Natural Vitality! Yummy looking salad Jess! I gotta make that dressing. Yummers! I hope you’re doing well! Take care!